Suggested citation for this article: McNeill LH, Emmons K. GIS walking maps to promote physical activity in low-income public housing communities: a qualitative examination. Prev Chronic Dis 2012;9:110086. DOI: http://dx.doi.org/10.5888/pcd9.110086. Walking is the most commonly reported leisure-time activity. Members of racial/ethnic minority groups and people of low socioeconomic status disproportionately live in urban environments that are perceived to be unsafe, thereby reducing opportunities for engaging in walking. We examined the use of walking maps for increasing physical activity (PA) among low-income residents of public housing sites in Boston, Massachusetts. PA facilities, local businesses, and destinations in a walkable half-mile radius of the housing community were identified and plotted on maps by using geographic information systems technology. Four focus groups (n = 24) were conducted to learn how the walking maps were used by the residents and to understand map features that promoted use. Maps were used by participants to increase their PA, and use of the maps increased participants’ awareness of community resources. Maps changed participants’ perception of distances and were discussed as a means of fostering a sense of community. Use of the maps also increased participants’ awareness of neighborhood incivilities. Barriers to map use were difficulty in interpreting the maps and lack of access to the maps. Walking is the most commonly reported leisure-time physical activity (PA) (1,2) and is often reported as a primary activity among racial/ethnic minorities and people of low socioeconomic status (SES) (3,4). It is inexpensive, is convenient, and requires no formal equipment. For many people, walking is a necessity due to limited access to public transportation and low ownership of personal vehicles. Evidence shows that the physical design of places where people live and work is associated with walking (5,6). Theoretically, urban environments are conducive to walking, given the abundance of sidewalks and parks and increased presence of public transportation, all of which are associated with walking (7,8). However, members of racial/ethnic minority groups and people of low SES disproportionately live in urban environments that are perceived to be unsafe, thereby reducing opportunities for engaging in walking (9). Interventions that simultaneously capitalize on the inherent PA resources in urban neighborhoods (eg, availability of sidewalks) and reduce the inherent barriers of such environments (eg, perceived danger) are needed. Walking maps, which often include landmarks (eg, schools, streets) and walkable destinations (eg, popular businesses), are increasingly becoming popular PA facilitators (10) that may help effectively increase PA among underserved groups. Walking maps that identify and display nearby opportunities for PA and help members of racial/ethnic minority and low-income groups incorporate PA into their daily routines may reduce real and perceived barriers to PA. Maps that highlight parks and safe and convenient walking routes with marked distances can help people become more familiar with their neighborhoods and discover PA opportunities in walking distance from their homes. These maps may reduce common PA barriers (eg, safety perception) among members of racial/ethnic minority groups by helping them form positive perceptions of walking areas and providing an environmental cue to be active (11,12). Geographical information system (GIS) is a helpful tool for creating user-friendly maps. GIS maps spatially and accurately represent the physical characteristics of a neighborhood, such as streets, points of interest (ie, stores or museums), and natural resources (ie, lakes, green space, or parks). Few studies have documented the use of maps to increase PA among groups (13) or have examined features of maps that may be helpful for residents of low-income communities. Many cities and states have created user-friendly maps to encourage their residents to be more physically active. However, few studies have evaluated the role of walking maps as a health promotion tool; therefore, we know little about the effectiveness of walking maps in increasing walking. This article reports findings from focus groups conducted in 2006 with participants enrolled in Open Doors to Health, a randomized colorectal cancer prevention trial funded by the National Cancer Institute that was conducted from 2003 through 2008 and delivered to residents of low-income housing in Boston, Massachusetts. Details of the study have been described elsewhere (14). Walking maps were developed and piloted, and focus groups were conducted to understand map features that promoted use. Maps were developed with substantial input from residents of housing sites, with emphasis on tailoring the maps to each housing site. On the basis of a literature review, we determined that the maps would include the 0.5-mile radius around each housing site as a walkable distance that would be achievable in approximately 30 minutes. One map was created for each housing site. A list of all potential walking destinations in that range was generated, which included parks and trails, businesses (eg, grocery stores, banks, post offices), and cultural destinations (eg, museums) (Figure). Although the primary route was 0.5 mile, we also included a 1-mile route to provide choice. Each walking destination was then identified using ArcGIS software (Esri, version 9.0, Redlands, California) and plotted on the maps. Maps included information about PA benefits and recommendations and information on safe walking practices that were specific to each neighborhood. User-friendly instructions helped residents to use the maps to plan a walk that could be completed in 30 minutes or less. Maps were created in both English and Spanish and were placed in high-traffic areas (eg, housing site lobby) and were distributed to participants through housing site residents who were recruited and trained to be peer leaders. Residents were also encouraged to use the walking maps to plan walks for the walking clubs that were organized as part of the intervention. Focus groups were held 3 to 6 months after the maps were created and distributed. Eligibility was residing in a participating housing site and being willing to participate. Participants were recruited by peer leaders and Open Doors to Health staff by word of mouth until a focus group session included 6 to 8 people. Each focus group was held at the housing site, and participants received a $20 gift card as an incentive to participate. We selected 4 housing sites to participate in the focus groups — 3 that reportedly used the maps and 1 that did not. Residents of the housing sites included in this study were racially, ethnically, and demographically diverse. The first focus group was predominantly African American, the second was conducted with a Spanish-speaking Latino population and in Spanish, the third consisted of a housing site for the older people that had a mixed racial/ethnic population, and the fourth was conducted at the housing site of participants who did not use the map and was mixed by race/ethnicity and age. Each focus group lasted approximately 1 hour and was conducted in English or Spanish, using a semistructured script with follow-up probes. Questions focused on how the walking maps were used for PA, how the maps influenced motivation for PA, features that participants liked and disliked about the maps, and barriers to and facilitators for using the maps. All focus group interviews were recorded and transcribed verbatim by a professional transcriptionist. The Spanish transcript was first transcribed in Spanish and then translated to English. Two members of the research team reviewed transcripts and field notes to code transcripts. Coders met to resolve discrepancies and achieve consensus. An NVivo database (version 8, QSR International, Cambridge, Massachusetts) was created to enter codes first as free nodes and then as tree nodes to facilitate further analysis of the interviews. Major themes were determined a priori on the basis of the focus group interview guide. All interviews were systematically coded for emerging themes that were not specifically asked about. Quotes were selected to support explanation of themes. Themes presented reflect those most commonly mentioned by participants regarding how the walking maps were used for PA.
A total of 24 residents (3 men and 21 women) participated. Focus groups ranged in size from 4 to 13 participants per group (mean, 7 participants). Participants ranged in age from 20 to 65 years. Approximately 75% self-identified as black or African American, and almost all (94%) were born in the United States. Fifty-three percent reported having more than a high school education (primarily some college), 26% had high school/GED completion, and 21% had less than high school. Half of the participants reported working outside the home (31%, full-time; 19%, part-time), 11% self-identified as homemakers, and 39% indicated that they were unemployed (includes retired and disabled participants and homemakers). Five key themes emerged from the focus group analysis: 1) increased awareness of neighborhood resources, 2) walking for pleasure and utilitarian purposes, 3) perception of distances, 4) community uses of the maps and fostering community, and 5) barriers to map use. Each of these themes is described below.
. . . the more I looked into it . . . I did not know there were so many little things in the surrounding areas. I liked seeing the growth of the neighborhood. It makes you realize that we’re in the middle, you know, of the heart of the city. You know, that? We’re accessible to everything. Every time that one walks, one releases the mind . . . looking at the view, the [new] things . . . all the beauty. Others talked about learning new information from the maps. For example, many participants learned by using the maps that 1 mile is equivalent to walking 4 laps around a standard running track. It should be much nicer kept . . . I don’t think a bike path in any other town would be like that. It is beautiful and it has kind of like a little pool too, you know, and I find that it is [a] very interesting place and good [for] exercise . . . very beautiful. When you [start walking] first you just wanna get home, but still you want to know that accomplishment. That you accomplished something. That I did this and I walked. Another participant used to live near a large park in another neighborhood and recently moved to the housing site. She used the guide to help her increase her activity in her new neighborhood. I can walk in [the new neighborhood] without walking in the park and get the same results. Well we took advantage of the map because [now] we know how many miles we were walking. We walked around twice the same route that was on the map. For those that didn’t want to walk too much. And for those who did wanna walk more, we did the same route over again. I [used] to jump on the bus and go to Walgreens, and now that I know it was that close, I just walk. I used to drive just to the post office, and that’s ridiculous. Really! Now I’m just walking everywhere. I used to take the bus to the [medical center] . . . I kinda walk now. It’s a nice walk. I just [got] used to it. Sometimes you can beat the bus walking. And you think you’re doing a long walk, but if you look at the [map] it’s not really that far. Several residents also mentioned that the walking map could be a resource for new residents of the neighborhood to help them become familiar with their new surroundings and highlight resources not well-known in the housing community. For example, 1 housing site had a community garden that focus group participants thought few residents were aware of; participants thought that including this information on the map would help new residents know about it. Specific challenges related to using the maps in each community and ways to address these challenges were discussed. In 1 group, participants brainstormed ideas for distributing maps to new community residents. In particular, they thought the maps would help both newer and older residents learn about the positive history of the neighborhood and possibly encourage a sense of community. In another group, participants discussed the poor outdoor maintenance in their neighborhood and ways they could work together to improve the conditions. The most commonly cited barrier among participants of the focus group that was conducted with map nonusers (primarily older adults) was trouble interpreting the map; these participants found the walking map to be confusing and were unclear as to its purpose. Participants in this group, as well as those of the other groups, thought that one-on-one instruction on how to use the map was needed for many older residents. Although maps were placed in central areas in each housing site (ie, outdoor, in the community center, near the doors, near the elevators), nonusers of the maps thought that additional maps should have been placed more prominently throughout the housing site to encourage use. A concern was that the highly trafficked areas where the maps were placed created more opportunities for vandalism, an issue that was emphasized by participants in the focus group of older residents. The number of destinations on the map was mentioned as both a strength and a barrier. For some participants, the number of destinations, landmarks, and information included on the maps were just right. Other participants said they would have used the maps more if more and different destinations were indicated. Participants of only 1 focus group mentioned safety as a barrier to using the maps; these participants specifically suggested that we include a caution note that instructed map users to walk in groups for safety reasons. Graphic displays of data can be powerful and informative, and walking maps that display PA opportunities and resources may be useful in increasing walking in the immediate neighborhood of urban, public housing residents. Our findings suggest that walking maps may be a tool for increasing walking in this setting. The maps capitalized on walking, the most commonly reported leisure-time activity, by making it more interesting and interactive. Focus group participants liked the maps and used them for their intended purpose: to increase their PA.
Studies indicate that more outdoor physical activity resources (ie, parks and green space) may be available in low-income neighborhoods than in high-income neighborhoods (15-17), and maps can provide a way for people to quickly identify these key features of their neighborhoods. However, resident perceptions of those resources are often poor (18). In our study, walking maps may have helped to create more positive neighborhood perceptions among participants, although the negative aspects of some neighborhoods may also have been reinforced. The maps used in this study helped to reduce common psychosocial barriers to walking, such as lack of time and perceived safety. Focus group participants noted that walking was sometimes quicker than taking the bus to reach destinations, thereby potentially freeing up some of their time. Although neighborhood safety is often a concern among low-income and minority groups (19-21), participants of only 1 focus group mentioned safety as a barrier to using the maps. There may be several reasons for this finding. Many participants noted that they used the walking maps as part of their walking clubs and the walking clubs likely helped to increase feelings of safety. Furthermore, in the larger trial, 80% of participants reported their neighborhood to be safe in the daytime. Our study has limitations. First, our study used data collected from focus group participants, which are subject to social acceptance bias, among other types of bias, in qualitative research. Second, we used a small sample size and participants from housing sites from 1 city, so our results may not be generalizable to residents of housing sites in other US cities. Third, several activities were simultaneously being implemented in the housing site during our study (eg, onsite exercise classes, peer support, walking clubs); therefore, the responses about the walking maps may be attributable to these other activities and not the maps. 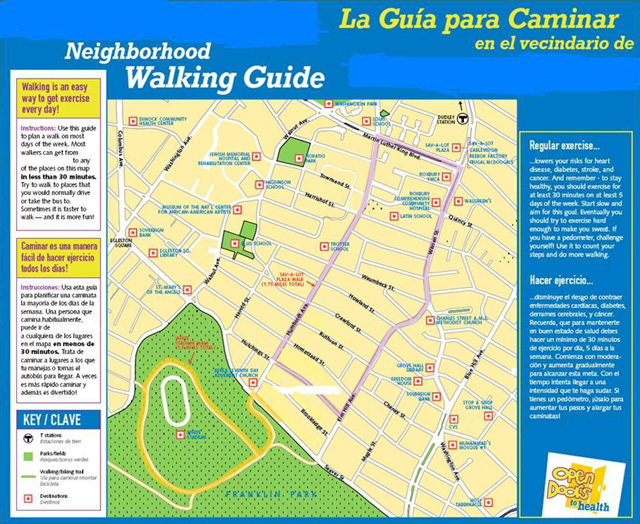 We suggest recommendations for creating neighborhood walking maps. First, maps should be tailored to each neighborhood or area and should be created to be culturally appropriate, ideally with neighborhood resident input. Second, maps should be aesthetically pleasing but not too “busy.” Achieving this characteristic may be challenging; a certain number of destinations should be included to promote use of the maps, but too many destinations make the maps hard to interpret. Third, the goal of the maps is to motivate residents to use them. Displaying maps in accessible places or providing maps to new residents may help to promote neighborhood walking or other collective activities. Healthy People 2020 goals for PA include increasing the proportion of trips made by walking (22). To achieve this national objective, innovative interventions and programs are needed that promote accessible and affordable community resources for PA and that simultaneously enhance the desirability of neighborhood pedestrian walking. Walking maps may be a tool for increasing walking, thereby addressing disparities in PA among underserved populations. This research was supported by grants 5R01CA098864-02 and 5K05CA124415-04 from the National Cancer Institute and support to the Dana-Farber Cancer Institute by Liberty Mutual, National Grid, and the Patterson Fellowship Fund, and the Yerby Postdoctoral Fellowship Program at Harvard School of Public Health. Corresponding Author: Lorna H. McNeill, MPH, PhD, Department of Health Disparities Research, University of Texas M.D. Anderson Cancer Center, 1515 Holcombe Blvd, Unit 1440, Houston, TX 77030. Telephone: 713-563-1103. E-mail: lmcneill@mdanderson.org. Author Affiliation: Karen Emmons, Harvard School of Public Health and Dana-Farber Cancer Institute, Boston, Massachusetts. Siegel PZ, Brackbill RM, Heath GW. The epidemiology of walking for exercise: implications for promoting activity among sedentary groups. Am J Public Health 1995;85(5):706-10. Simpson ME, Serdula M, Galuska DA, Gillespie C, Donehoo R, Macera C, Mack K. Walking trends among US adults: the Behavioral Risk Factor Surveillance System, 1987-2000. Am J Prev Med 2003;25(2):95-100. Henderson KA, Ainsworth BE. A synthesis of perceptions about physical activity among older African American and American Indian women. Am J Public Health 2003;93(2):313-7. Mier N, Medina AA, Ory MG. Mexican Americans with type 2 diabetes: perspectives on definitions, motivators, and programs of physical activity. Prev Chronic Dis 2007;4(2):A24. http://www.cdc.gov/pcd/issues/2007/apr/06_0085.htm. Saelens BE, Handy SL. Built environment correlates of walking: a review. Med Sci Sports Exerc 2008;40(7 Suppl):S550-66. Owen N, Humpel N, Leslie E, Bauman A, Sallis JF. Understanding environmental influences on walking — review and research agenda. Am J Prev Med 2004;27(1):67-76. Lopez RP, Hynes HP. Obesity, physical activity, and the urban environment: public health research needs. Environ Health 2006;5:25. Saelens BE, Sallis JF, Frank LD. Environmental correlates of walking and cycling: findings from the transportation, urban design, and planning literatures. Ann Behav Med 2003;25(2):80-91. Gordon-Larsen P, Nelson MC, Page P, Popkin BM. Inequality in the built environment underlies key health disparities in physical activity and obesity. Pediatrics 2006;117(2):417-24. Deehr RC, Shumann A. Active Seattle: achieving walkability in diverse neighborhoods. Am J Prev Med 2009;37(6 Suppl 2):S403-11. Ainsworth BE, Wilcox S, Thompson WW, Richter DL, Henderson KA. Personal, social, and physical environmental correlates of physical activity in African-American women in South Carolina. Am J Prev Med 2003;25(3 Suppl 1):23-9. Giles-Corti B, Donovan RJ. The relative influence of individual, social and physical environment determinants of physical activity. Soc Sci Med 2002;54(12):1793-812. Rosenberg D, Kerr J, Sallis JF, Patrick K, Moore DJ, King A. Feasibility and outcomes of a multilevel place-based walking intervention for seniors: a pilot study. Health Place 2009;15(1):173-9. McNeill LH, Coeling M, Puleo E, Suarez EG, Bennett GG, Emmons KM. Colorectal cancer prevention for low-income, sociodemographically-diverse adults in public housing: baseline findings of a randomized controlled trial. BMC Public Health 2009;9:353. Cradock AL, Kawachi I, Colditz GA, Hannon C, Melly SJ, Wiecha JL, Gortmaker SL. Playground safety and access in Boston neighborhoods. Am J Prev Med 2005;28(4):357-63. Ellaway A, Kirk A, Macintyre S, Mutrie N. Nowhere to play? The relationship between the location of outdoor play areas and deprivation in Glasgow. Health Place 2007;13(2):557-61. Lee RE, Booth KM, Reese-Smith JY, Regan G, Howard HH. The Physical Activity Resource Assessment (PARA) instrument: evaluating features, amenities and incivilities of physical activity resources in urban neighborhoods. Int J Behav Nutr Phys Act 2005;2:13. Franzini L, Taylor W, Elliott MN, Cuccaro P, Tortolero SR, Janice Gilliland M, et al. Neighborhood characteristics favorable to outdoor physical activity: disparities by socioeconomic and racial/ethnic composition. Health Place 2010;16(2):267-74. Gallagher NA, Gretebeck KA, Robinson JC, Torres ER, Murphy SL, Martyn KK. Neighborhood factors relevant for walking in older, urban, African American adults. J Aging Phys Act 2010;18(1):99-115. Dunn MZ. Psychosocial mediators of a walking intervention among African American women. J Transcult Nurs 2008;19(1):40-6. Martinez SM, Arredondo EM, Perez G, Baquero B. Individual, social, and environmental barriers to and facilitators of physical activity among Latinas living in San Diego County: focus group results. Fam Community Health 2009;32(1):22-33. US Department of Health and Human Services, Office of Disease Prevention and Health Promotion. Healthy people 2020. http://www.healthypeople.gov.